Quality products start with quality ingredients: fresh, sweet cream made from grass fed cow’s milk and a touch of salt. We take these three simple ingredients and turn them into something exceptional. How? Using modern technology and a method that’s over 100 years old. 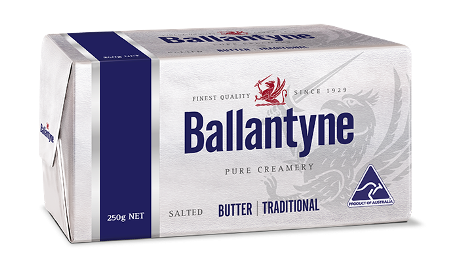 The result is premium quality butter with a distinctly clean, and full-bodied taste. A butter that bakes better, tastes better, and roasts better. Pasteurised cream (min. 80% milk fat), salt.